An important cornerstone to any organization’s business success is a well thought-out marketing strategy. While the legal, accounting and investment banking professions may be steeped in distinguished tradition, the marketing world is dictated by vogue trends and cultural shifts. The two worlds come together when firms determine the clients they want to attract and the messages they need to convey to engage those clients. The recent Ford Trend Report for 2015 focused on the new client powerhouse: Generation Z. This generation is prone to conduct independent research through social media, rather than asking peers and mentors for advice. They are more likely to take the risk and start a business and less likely to pursue an advanced degree than a Millennial (Ford Trend Report for 2015). The new Generation Z client will still need all the legal, accounting and investing advice that earlier generations needed, but they will seek it and conduct “pre-purchase” research from a completely different source. Enter: World Services Group. 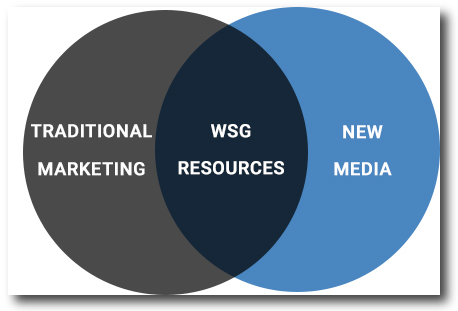 WSG continues to develop new platforms to help members and their respective marketing groups to showcase businesses and leverage efforts across new media. WSG hosted the 'Join the Conversation' webinar series to help members understand the world of SEO, social media and content marketing, as well as rolled out the new Practice Group Blogs page and introduced a mobile app. All of these tools provide enhanced exposure to member organizations, create searchable content on the web, and ultimately help to increase business opportunities. Continue doing great business as usual and being part of the Network – We’ll continue with our mission to stay in tune with the current trends and enabling member firms to remain competitive in today’s global multidisciplinary services environment.